It was rather dull and overcast when we gathered in the car park on Divis Road. 27 set off along the road towards the 1st "trail" on our walk, the Lough view trail. By the time we had completed this and the Summit trail our nuumbers had swollen to 30 as we had been joined by other Spartans along the way. We then undertook the Heath trail which because of the recent rain was wetter than expected. Some of the wooden walkways were rather slippery which proved amusing for some as we each tried to cross. After the Heath trail a few left early and the rest of the group proceed to the Ridge trail were we stopped to look at the views over Belfast which were rather limited by the overcast day. We finished the walk around 3pm. I was advised by Sammy that we had walked 9.8 miles. A good day out and no rain in November was a great bonus. ​Some 20 Spartans assembled in Ardglass on this blowy but otherwise fine Saturday morning and were promptly allocated to cars to transfer all to the start point at Kilclief for our walk along section 2 of the Lecale Way which connects Strangford and Newcastle. The name Lecale was ascribed to the area in the 8th century and is derived from the Irish Leath Cathail meaning 'Cathal's territory' after one of the Ulidians or 'Princes of Ulster'. The first section of the walk involved some scrambling and a mix of beach and grassland walking. We walked uninterrupted along the beaches with low tide and stopped halfway at the convenient picnic facilities at Ballyhornan overlooking Guns Island. The sun appeared more during the second half of the walk and offered great views out to sea while we followed more distinct pathways, passing St Johns Well soon before joining back onto tarmacked minor roads. A little local knowledge led us on a quiet country lane avoiding the busier main road which led us to the outskirts of Ardglass. Arriving back at the carpark we arranged lifts back to cars for some while others availed of the coffee shop before heading for home. All agreed this was lovely way to spend a bright November Saturday. Round Seefin; Long Seefin; Rocky; Hares Castle. Although the forecast was for a fair and sunny day ... and I believe this is what most people experienced, the Mournes had a different day in mind for us. Our weather has become a lot cooler as we reach the weekend where the time slips away from British Summer Time - back to Greenwich Mean Time and the trials of Winter ahead. This Saturday was sunny and bright but as we approached Kilbroney for the start of the walk, we could see a light dusting of snow on the highest of the surrounding hills. … and sure enough as around twelve of us ascended via the Fiddlers Green to the Big Stone and beyond and the top of Slievemeen - we also encountered little deposits of snow which the northerly wind was blowing against walls and hedges. From Slievemeen we topped the nearby Slieve Martin and enjoyed the autumnal clear views all around. Our walk ended through the Rowans and back through Kilbroney Forest and to the little coffee shop _ Synge & Byrne for a warming cuppa. Thanks Davy for a great walk. ​It was a beautiful early autumn morning. Twelve members of the Spartans met in the north car park at Carnlough. We left the village and climbed through the old quarry to ascend to the Trosks and eventually onward to Lough Natullig and to Altan Burn where we had a super second lunch with Glenariff stretched out below. Our walk along the glen was wonderful. We encountered sheepdog trials in the valley . Eventually we reached the coast at Waterfoot and continued on to Cushendall where Jack's van awaited for the return trip to Carnlough. A great walk on a bright autumn day. Thanks Jack. The weather was perfect with sunshine all day giving clear vistas. We welcomed 5 visitors along with 8 Spartans … our route included the mountains of Ott, Carn and Doan. One of our visitors followed up with a nice email … " "the Spartan Red Sox Walking Club members were so welcoming, helpful as well as great fun … thank you" from Sara. After watching the farmers and their dogs round up the sheep at Deers Meadow for winter, we set off on a circular walk lasting almost 6 hours. Twelve Spartans and one visitor enjoyed light winds, dry weather and sunny intervals. Excellent visibility afforded views of Lough Neagh, Slieve Croob, Gullion, Divis Mountain and Cave Hill. Distance was 8 miles (13 km) and the total ascent was 2,132 feet (650 metres). 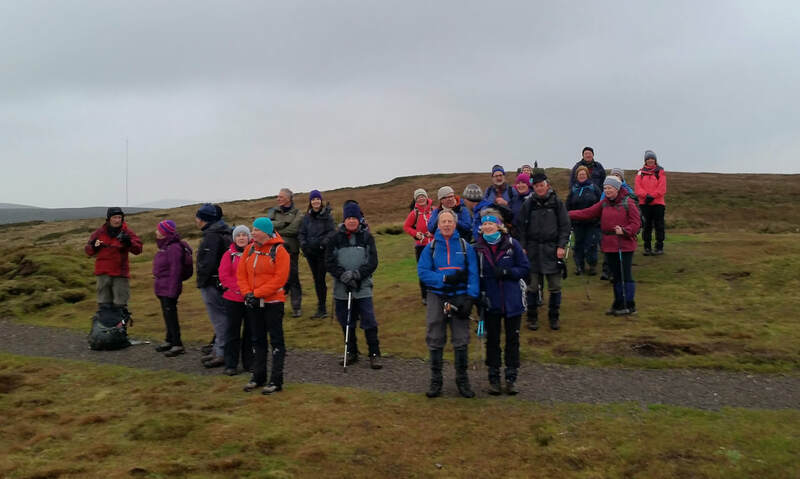 Derek had organised an interesting walk for us in the Sperrins - the Altbritain Circuit on the east side of the Sperrin’s main ridge to the north side of the Glenelly river valley. A walk with a ‘wild’ factor in largely pathless terrain. Nine of us met at Glenadra Bridge on the B40 road between Draperstown and Feeney. The hills covered were Craigagh Hill, Spelhoagh, Ougthmore and Mullaghaneany (627 metres) which we walked in a clockwise direction. The views were fairly good considering that the weather forecast was for deteriorating weather - cloud, winds and rain. Our views included much of the Lough Neagh basin and the Mournes skyline was clear in the south east. 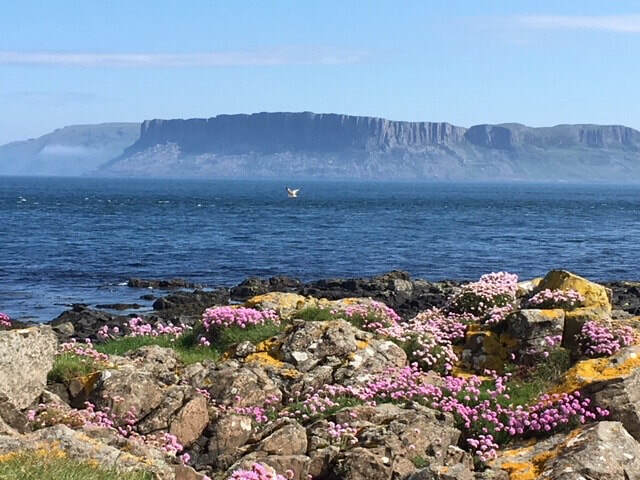 To the north west we could see Lough Foyle with Benbraddagh and Binevenagh to it's east and glimpses of Inishowen beyond. We managed to outrun most of the rain and after completing what turned out to be a very fine walk we all went to Draperstown for a well deserved cuppa. Thanks Derek. Derek had organised for 10 Spartans to stay at the Ballyhoura Mountain Lodges near Mitchelstown, Co Tipperary for the club's August Bank Holiday Weekend Trip. On Saturday we began walking up the path known as the Black Road and came to a lonely stone which commemorated a fatal air-crash from the 1970s. .. "I have slipped the surly bonds of earth and touched the face of God". Our climb took us to the eastern side of Galtybeg mountain and over the top of the highest peak Galtmore - (917m). As we ascended our views changed and we looked down onto the northern side of the range with it's glacial features of corries and lakes. Beyond we could see the Wicklow mountains in the north east; the city of Limerick and the Shannon Estuary in the north west and directly below us the verdant Glen of Aherlow; in the south east were the neighbouring Knockmealdown and Comeragh Mountain Ranges and in the distant south west but visible on this clear day we could see the jagged outline of the Magillacuddy Reeks in Kerry. Very beautiful views all held together by a carpet of fertile green fields that extended into the distance. An active weather front brought a lot of wind and rain on Sunday morning and although it slackened a little, Derek had wisely chosen a low level walk. From the Glen of Aherlow, we walked towards Lough Curra. The well marked path led us out onto the slopes of Knocknanuss which provided some shelter from the wind as we climbed to the rim of the Lough where not only did it seem like a totally different day, but more like a different season as the cold winds battered us. A sheltered lunch was followed by a quick descent. As is traditional on Spartans trips, we dined out - the Marketplace Restaurant, Mitchelstown where we chatted and reflected on a restful weekend of good walking and good company and chat. Everyone contributed to a wonderful weekend where Derek had organised great accommodation in a lovely area ... and given us the opportunity to take away some great memories. We started our journey by bus to Ligoneil where 15 of us began the walk. Ligoniel village lies on the north west periphery of Belfast, about 3 miles, as the crow flies, from the city centre. Its geological setting gives it the name Lag an Aoil, ‘hollow of the lime’, as it is snuggled into the limestone hollow of Wolf Hill. The name Wolf Hill originated as the last wolf in Ireland is said to have been shot there in 1692. The slopes of Wolf Hill were the focus of the 19th century Linen Industry. The concentration of mills here was due largely to the power and reliability of water flow from the Ligoneil River. There are a few remnants of Linen's glory days in the area and we got to see the old mill ponds. All looking lovely in the June sunshine. We climbed through the woodlands nearby in Ligoneil Park and encountered the beginnings of the River Farset after crossing the Hightown Road. Soon we were winding our way through beautiful hedgerows and fields of wildflowers planted by Belfast Hills Partnership) and gently climbing towards McArts Fort on Cavehill for our lunch stop. We all gathered at our accommodation - The Song House , just outside Falcarragh in North Donegal on Friday evening with the promise of fine weather in the forecast for the whole weekend - a continuation of what we had already been experiencing for a few days prior. Jim and Joan had made a lovely evening meal to welcome us and the evening was filled with conversation and good humour. We walked around Horn Head on Saturday from the Coastal Station and along the cliffs in an anticlockwise direction until we eventually reached Tramore Beach and crossed the sand dunes back to our cars. After the walk, we were all royally entertained by Robin and Valerie who knew what the Spartans would crave after a day's walking - tea, cakes and cool drinks - all greatly appreciated. Later we enjoyed a beautiful meal in our accommodation prepared by Ann Marie and dessert by Helen. On Sunday, we split into two groups - one group walking from the house and close to Muckish and it's environs and along the old disused railway which has been transformed into a walk way; the other group ascended Muckish from the Miner's Track and made an interesting descent back to the cars and the starting point. As is customary on these occasions, we enjoyed a meal at a local restaurant on our second night - The Loft in Falcarragh. Our last morning was the usual decamping from our wonderful temporary household and folks heading off to do several things - a walk near Glenveagh; a cycle from Falcarragh to Dunlewy and back. etc. I even managed on the return journey home to fit in a visit to The Grianan of Aileach .... always meant to do it ... with that weather, it just seemed like the right time !!! Thanks to Jim and Joan - a great weekend of sunshine, activity and craic. We had perfect weather conditions for this walk with blue skies, bright sunshine and just a gentle breeze to keep us cool during the steep ascents. Twelve Spartans participated in the walk. We commenced at Deers Meadow and ascended Pigeon rock. A short breather allowed us to enjoy the splendid views at the top before commencing the descent. Before climbing Slievemoughanmore, we opened the rucksacks and took out the flasks for first lunch. Re-energised, we proceeded to climb both Slievemoughanmore and Eagle. A well earned rest at the top of Eagle and second lunch gave a good opportunity to enjoy the sunshine and scenery. The walk along the ridge of Eagle provided good views across the valley and to the mountains beyond, still bathed in bright sunshine. We descended Eagle, and took a break before the final ascent to the path that led to the carpark on the Moyad Road. The Spartans rented two houses a few miles apart just outside Newport, Co Mayo for the early May Bank Holiday - 8 in one house and 13 in another giving a total group of 21. Thankfully the weather was fantastic the whole weekend making the 4-5 hour journey each way very enjoyable and scenic. 15 Spartans clambered up Croagh Patrick (764m) using a quiet route along Ben Gorm going along the ridge to the summit for spectacular views over Clew Bay while we enjoyed our lunch along with a large number of other walkers. We scrambled down the traditional pilgrim route where a well-deserved cold drink was taken afterwards outside in the lovely sunshine at Campbell’s pub. An alternative Achill Island walk was also on offer and a group of 4 set off from Keem Strand at the west end of Achill and climbed to the lookout post visible 200m above. After enjoying the views across Clew Bay and Croagh Patrick in the mist we proceeded NW along the ridge and were at times surrounded by the low clouds and at others viewed to the waves far below. The wind along the top of the cliffs made progress challenging at times. Eventually turning back at the far end of the ridge making our way downhill towards 2 small lakes on the col below. From here the group followed a pretty little stream back to the carpark. 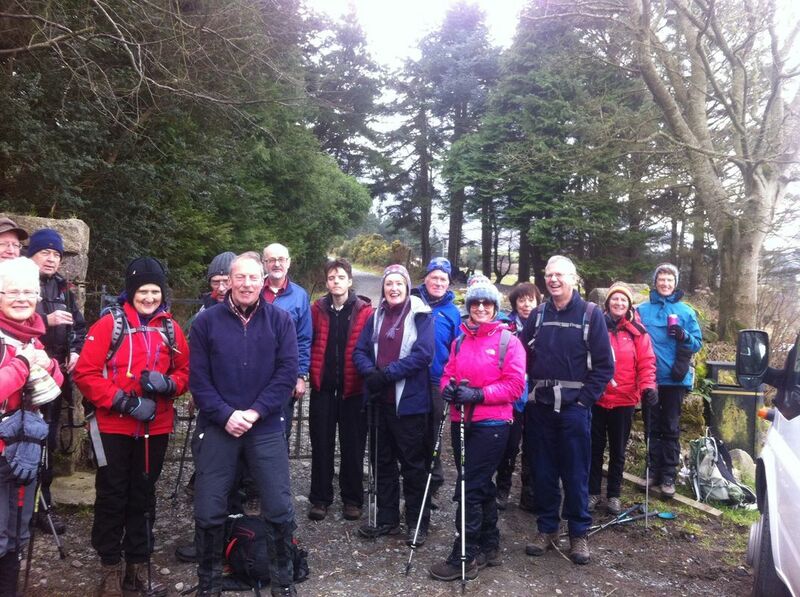 On Sunday, 11 Spartans set out to walk on the Bangor trail at the top of Lough Feeagh. It was a beautiful day with sunshine. This is very remote country and the walk took us along the side of extensive forest plantations with nice views of Correen More (a small but pretty mountain ridge). We then climbed Correen Beg from whence there were extensive views of the bog land to the north and west stretching to the North Mayo Coast and also views of the extensive and remote wild Nephin Beg range. Some opted for a different return route via the Correen More ridge which proved quite challenging. However altogether a lovely day finished off by a laze in the grass in the sun by the strangely named Holes river. The rest of the group took part in other activities including a cycle along the Great Western Greenway from Achill to Newport and exploring some of the loop walks in the vicinity. The traditional excellent end of trip dinner was provided by the Hotel Newport followed by some enjoyable music afterwards in the hotel bar. A very enjoyable weekend with all making a positive contribution to the success the trip. ​A lucky 13 of us met at the car park at Slemish and set off up the mountain on a slightly chilly but bright sunny morning. A quick steep climb took us to the summit where we enjoyed a 360° view of the Antrim countryside and as far afield as Scotland and the Mournes. We took a more gentle descent at the SE end of the mountain and had a quick snack before setting off along the Antrim Hills Way across a boggy valley towards Shillanavogy. Here we crossed the road and continued to follow the Antrim Hills Way signs over Glenhead and on to lovely farm tracks which made the walking a lot easier after the rough terrain we had experienced up to this point. A gentle couple of miles down hill took us to the cars that had been left early at the Glenwherry hill farm. We all climbed in and drove back to Slemish. We had 17 walkers ascend from the Happy Valley along to the top of Meelbeg. It was sunny and bright with good visibility - although a cool wind was blowing on the tops of the hills. We descended to between Meelbeg and Meelmore and moved on to the Windy Gap before climbing to the top of Bearnagh where we had a wonderful elevated lunch stop. After reaching the Hares Gap, we climbed the side of Slievenaglogh and descended to the Trassey Track via the Green Road. Our day ended with a cuppa in Meelmore Lodge. Sunday 1st April. Snowdon,1085m via the Snowdon Ranger path. Weather cool. Summit snowy and icy. Astonished by the hundreds of people on the top. Tuesday3rd April. Glyder Fach, 994m and Glyder Fawr, 1001m. Ascent via the Miner’s Track and steep descent through scree to Afon Las River and Snowdon ‘Park and Ride’ carpark. Tough walk. Cold and windy. Wednesday 4th April. Coastal walk from Llandudno around the Great Orme. Wonderful sea views then no views except of thick fog while the rain poured down. Had to use a compass to find the road back to Llandudno. Thursday 5th April. Public footpath from Bethesda village to Cwmglas Mawr. Ascent to Carnedd Llewelyn 1064 m via snow/ scree. Traversed the ridge to Carnedd Dafydd 1044m and descended Mynydd Du ridge to starting point. Beautiful day. Friday 6th April. Ogwen cottage to Cwm Idwal and a high level loop back to starting point. Stunning mountain scenery. A wonderful week of walking. ​After several weeks of inclement weather, 19 Spartans enjoyed glorious sunshine throughout our hike in the Mournes. We began at Leitrim Lodge Car Park, ascending to Altataggart Mountain, followed by Pierces Castle where the views of the mountains as far as Lough Neagh were spectacular. From there, we climbed Tornamrock and Rocky Mountains. We finished at Hen Car Park later in the afternoon. A memorable day with good company and craic! ​As the whole of the country was feeling another winter blast from the mini Beast from the East, nine Spartans assembled at Irene's meeting point of Ott car park. It really did feel as cold as forecast and we were walking with a cold, cold wind in our faces. Thank goodness for the wall which sheltered us from the worst of the icy blasts as we ascended Slieve Loughshannagh, Meelbeg and Meelmore where we stopped for a frosty lunch by the tower there. It was nice to descend towards the valley and see our destination of Meelmore Lodge in site where we finished with a much needed hot cuppa. A cold morning in Donard Car Park greeted the eighteen of us for the start of the walk. Thanks to Robin's sensible suggestion, we decided to take the minibus to the start of the walk at Trassey car park. Mourne Bus driven by Peter arrived in plenty of time and once everyone had availed themselves of the facilities, we set off to Trassey. The minibus was an excellent choice and at £3 per head good value for money. At Trassey , the car park was full even though we arrived just before 11.00am. Stopping for a group photo at the gate taken by Peter, we headed up the track. The track was firm and not too much water run off. Before reaching the path up to Hare's Gap, we took a left up the Green Road. It is always a lot further on than I remember, but we had no trouble finding it. The ground was frozen although muddy underneath the ice. After about an hour's walking, we reached the Mourne Wall for a well earned stop and First Lunch/ Coffee Stop. I had expected the wind to be a problem, but it was not too bad despite the cold. After the stop we turned left following the wall on the north side as this seemed the most sheltered. We made it up Slievenagloch and continued along the wall to Slieve Corragh. There were even some views along the way which made things more bearable. The rocks at Pot of Legawhery looked impressive but not impressive enough to make me want to scramble up them. We met Andrew who had come up another way and proceeded along the wall on to the stone hut on Commedagh. As we approached the top, the wind got up and the ground was covered in ice which had solidified into crystals on the blades of grass. We crouched down in hollow below the hut to eat our lunch. There was not much shelter from the biting wind so we did not hang around too long after eating. We got to the actual summit of Commedagh and headed off down the ridge over Shan Slieve. It is quite a steep descent down to the forest, but at least we could see where we were going. The forest was a bit muddy but at least it was more sheltered. We took the easier but longer path down and reached Donard Car Park just before 4.00pm. Plenty of time for a cup of coffee, but too late to see the end of the rugby. Carlingford was busy on this bright and cold Saturday morning. A large group of walkers were gathered on the green beside the Tourist Office - from the Irish Police Association. Our group of around 15 walkers walked through the village and along the green path in Carlingford Wood and ascended the sides of the hill to eventually top The Eagles Rock. We then traversed the ridge - sometimes accompanied by some mist to reach the Trig Point at 588 metres above sea level. As we descended, the cloud and mist that had been with us from the beginning of the day disappeared and left us with clear blue skies and wonderful views. Our group split at the saddle to the south east, with some returning directly back to Carlingford whilst the remainder of the group climbed the gentle slope to the south and rested by a recently erected cross. Carlingford village seemed quite busy when we returned. Some of our group retired to McKevitt's Hotel for a meal and a chance to relax after our activities. ‘Well- full use was made of the weather window opportunity that very fortunately presented itself for this one. The first half of the walk was bathed in beautiful winter sunshine and blue skies. The second half was a bit greyer and there was some patchy rain but not much. Five Spartans and one Spartan-elect set out with enthusiasm and energy to explore this ‘new’ walk and were eager to see what views lay ahead on the next section. And what views they were too- from snowy forest trails which were almost alpine-like in nature to the snow covered tops of the surrounding Antrim Hills. The main visual (and aural) treat though was the Essathohan waterfall about half way round which was fuelled with snow melt and overnight rains and fairly thundered into the little gorge below. After a creditable four hours ten minutes to cover this 9.5 mile walk we just arrived back at the cars in time for the rain to come on in full earnest! Excellent timing indeed. We then retired to the excellent Laragh Lodge for some well-earned scones (with jam AND cream) and coffees. Many thanks to James, Nonie, Rachel, David and Noel for your company which added to this enjoyable walk. ​Jack organised a walk from Killyleagh out to Delamont Park. The weather had been quite cold with snow and ice during the week and this was a close option - especially with the Spartans Dinner being this evening in The Shandon Park Golf Club. There were five in the group and as we made our way around the park the weather improved and the grey skies turned to blue. The park and it's surrounding looked beautiful in the sunshine. There is a new coffee shop in the grounds of the park which we visited before making our way back to Killyleagh again. ​18 walkers set out on a pleasant morning to enjoy a days walk. We started at Donard car park in Newcastle and made our way to Tollymore keeping to the top perimeter of the forest. Leaving the forest we then started our climb up to Slievenabrock. The weather surprised us being bright and reasonably calm for we were expecting stronger winds higher up. We had a coffee stop at the outside of the forest wall and had lunch higher up after going over Slievenabrock and reaching the wall. As we reached the Glen river the sun was out making the afternoon quite pleasant. We made our way down to the Icehouse and crossed the Glen river and continued along the outside of Donard Wood to the quarry and down the Granite Trail and back along the lower track to the finish. Thank you to all who turned out and made the walk so enjoyable.. Sammy.